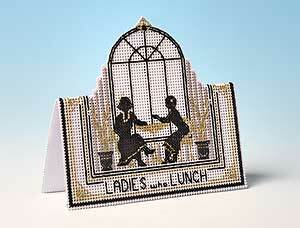 Two ladies meet for lunch and gossip in a typically Art Deco setting. The wording beneath the picture can be changed to an alternative sentiment. "Happy Birthday" is charted and included in the instructions and an alphabet is also added to help you devise your own message.